Happy Saint Patrick’s Day Everyone!! I’m part Irish, so of course I have to post something green today to celebrate. I saw this recipe on Semi Homemade, except Miss Sandra Lee baked her brownies in a crock pot. Well, if you know me, I’m not very patient. I like things done here and now. So, it’s probably no surprise that I didn’t want to wait 4 to 6 hours for these to be done. So I thought I’d try my luck at baking the brownies in a pan instead. I had to make up for the differences though. One of the things that Sandra said about her crock pot brownies was that cooking her brownies in the crock pot made them super moist. Well, I wanted my brownies to come out be super moist too!! So as an alternative, I substituted normal brownie mix, for fudge brownie mix. I prefer this anyways, because I can totally tell the difference between normal brownies to fudge brownies. To me they’re more moist, more flavorful, and just overall more amazing. AND lets not leave out the mint and cream cheese and all that goodness! These brownies are bomb!! And of course, festive and green 🙂 Enjoy!! P.S. I found it much easier to cut and serve these after letting the brownies completely cool in the fridge overnight. Also, if you wanna double the recipe and bake in a 9 x 13 inch pan, like I did, just be sure to bake for longer. You’re gonna want to bake for 60 to 70 minutes. Just be sure to check on it periodically to see if it’s done. Lightly spray a 8 x 8 inch pan with butter-flavored cooking spray. In a medium bowl, combine brownie mix. And if you use the fudge brownie mix, be sure to add the chocolate syrup that comes with it also. 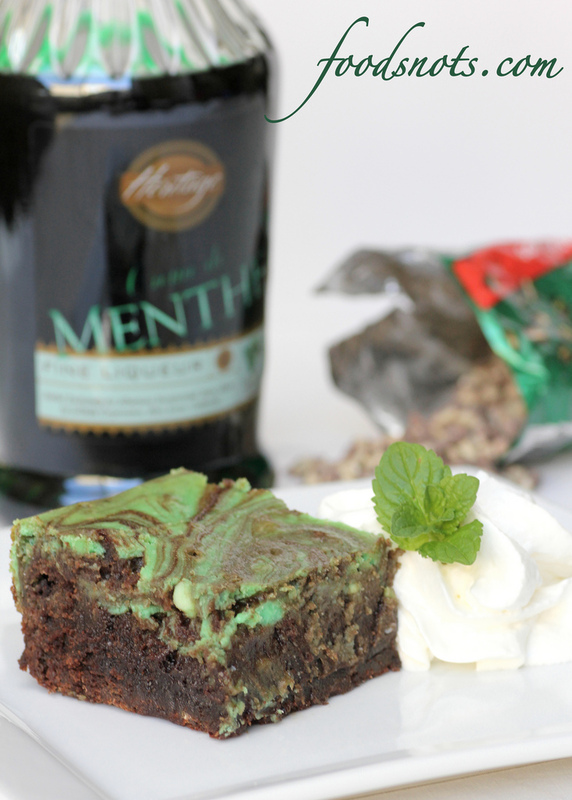 And 1/2 cup creme de menthe liqueur. I love the green. So gorgeous!! On medium speed, mix until mixture is combined. Fold in chopped mint thins. Then transfer to prepared pan and set aside. In a medium bowl beat cream cheese until smooth. Add remaining egg, sugar, and 2 teaspoons creme de menthe. Beat on low speed until combined. 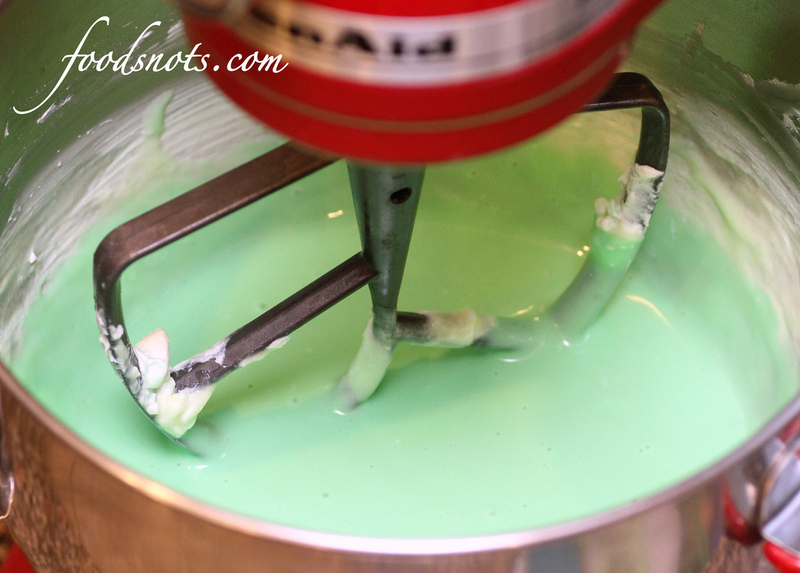 Add additional food coloring, if desired, to brighten green color. Spread over brownie mixture. Use a butter knife to cut cream cheese mixture into brownie mixture for a marble effect. Place pan on rack placed in the middle of oven and bake at 350 degrees F for 50 to 55 minutes or until toothpick inserted in the center of brownies comes out wet but not gooey.